Malachi O’ Doherty has kindly agreed to address the book launch of The Contested Identities of Ulster Catholics. This will take place on Friday, September 21st at 5pm, The Old Staff Common Room in the main Lanyon Building, QUB. This book investigates the often-fragmented nature of Ulster Nationalist / Republican / Roman Catholic politics, culture and identity. 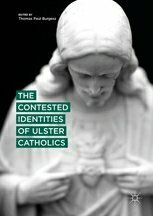 It offers a companion publication to The Contested Identities of Ulster Protestants (2015). Historically the Catholic community of Ulster are regarded as a unified and coherent group, sharing cultural and political aspirations. However, the volume explores communities of many variants and strands, belying the notion of an easy, homogenous bloc in terms of identity, political aspirations, voting preferences and cultural identity. These include historical differences within constitutional nationalism and Republicanism, gender politics, partition, perceptions of this community from The Republic of Ireland, and more. The book will appeal to students and scholars across the fields of Politics, Cultural Studies, Sociology, Irish Studies and Peace Studies. ➽Paul Burgess is editor of The Contested Identities Of Ulster Catholics. Previous Previous post: MoD challenging order to explain role in the north.